Several of the pieces below (the large decanters + vases) are attributed to Alrose in Leslie Pina's book Italian Glass: Century 20. They can often be found with small red "Italian Glass" labels, commonly found on glassware made in the Empoli region of Italy. It is now known that Alrose is not the manufacturer, but an importer of Italian glass + pottery. A quick search for "Alrose" on eBay usually results in several items of glassware + pottery, often bearing labels which read "An Alrose Original, Made in Italy". As most labelled examples turn up in the USA, it is assumed that Alrose was an American importer. The same items can sometimes be found in the UK with George Hardy import labels (British importer). 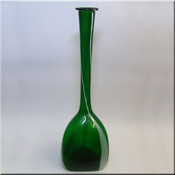 Alrose Italian Empoli green glass bottle/decanter. 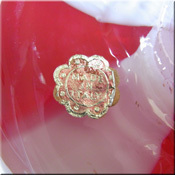 Ref: Italian Glass Century 20 p117. 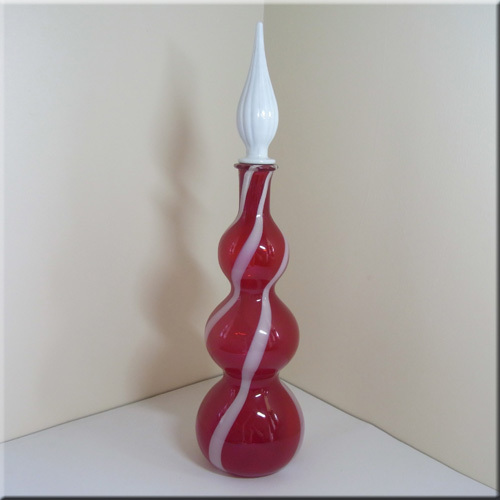 Alrose Italian Empoli red glass bottle/decanter. Ref: Italian Glass Century 20 p117. Alrose red glass bottle/decanter with red "Made in Italy" label found on Empoli glassware. Ref: Italian Glass Century 20 p117. Alrose blue glass tapering vase with red "Made in Italy" label found on Empoli glassware. Alrose orangey red glass tapering vase. Alrose green glass tapering vase. 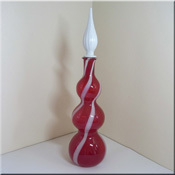 Italian Empoli red glass bottle vase with spiralling white stripes, probably from the same range as other Alrose items. Italian Empoli green glass bottle vase with spiralling white stripes, probably from the same range as other Alrose items. Alrose amber glass decanter (missing the stopper) with Alrose import label. Blue glass vase with white stripe, possibly from the Italian range imported by Alrose. Alrose red + white glass bottle/decanter (stopper missing) with red "Made in Italy" label found on Empoli glassware.